February being the month of love and all made me select two books which kind of fall in that genre. The reason why I say "kind of "is because they are not your typical romantic novels but these are books that make you appreciate love and loved ones even more. As the name suggests this book is the story about Ove. A story both sweet and hilarious. Ove, a Swedish man plans to commit suicide after the demise of his wife, Sonja but things don't work out as per his plans. This book is about love, the love he has for his wife, the love he has for the cat who he refuses to acknowledge as his pet, the love for his car, the love for his old neighbours whom he hasn't spoken to in a long time, the love for his new neighbours who keep intruding in his life. Fredrick Backman who is the author in this article says that Ove is basically drawn from him in real life. This books beautifully explains why people who are set in their way can be the best people to be around. 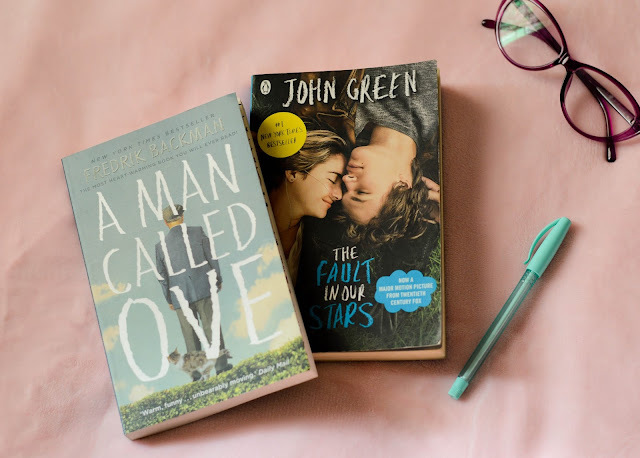 I have seen the movie cried my eyes out, read this book in 2014 cried my eyes out and re read it this month..guess what "cried my eyes out" Oh Gus you charming Gus why! This is a story about three people and how they deal with cancer. The young couple who know death is inevitable but still manage to find love and joy and humour and more love. It's also about the author of their favourite book who had dealt with cancer but has been shoved to the dark side of life. This book is a reminder that no matter what your going through in life you can always appreciate the love you get. Both these books were wonderful reads and now I am off to select two for the month of March. Have you read any of these books?if so how did u feel about them? In case you want to read any of these books you can get them here and here. Also do u have any particular books in mind for March?